In order to serve a diverse customer base, Datran provides two virtual computing platforms in its Cloud Computing Module. 1. VMware: Allows the operation of multiple operating systems on one computer. 2. Citrix: Allows the operation of multiple applications on one computer. VMware targets the Internet developer and scientific community. While Microsoft Windows has become a household word, many Internet services run on other operating systems such as Unix and Linux. For example EBAY uses both Windows and Unix in its data centers. With VMware, a programmer can move back and forth between the two operating systems on one terminal without the need to log onto two individual computers. Citrix targets general business applications. 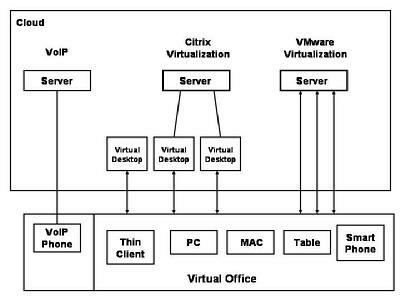 Wereas VMware is a server, Citrix can operate as a desktop - exactly as your laptop or desktop computer - with or without a server. The desktop can include all Microsoft office applications and you can add literally hundreds of other programs such as Quick Books, and many mobile applications such as GotoMeeting. Let Datran work with your IT team to duplicate and move your existing server into the cloud and try it free for 30-days.